We changed the name of our ministry from The Felicity Bee to A Symphony of Praise in 2018. Our name change followed the leading and direction of The Holy Spirit. Even though our name has changed, the relevancy of this post still holds true. I was a little girl when my dad nicknamed me “Bee”. It is a name that has stuck with me for over thirty years. When I decided to name this blog, I wanted the name to have a purpose, and The Felicity Bee was born. Bee, obviously because it is my nickname, but the more I study about the bumble bee, the more their purpose in nature defines our purpose here. You can read more about the birth of our name here. So many of us live life on repeat . . . a perpetual “Groundhog Day”. Wake up - take care of kids, or house, or self, or spouse - work - meals - church - ministry - hobbies - sleep - repeat. Again and again. Many years ago I was stuck in this cycle wondering, “Is this it? What is my purpose? Is this all there is to life?”. I was a good mother, a good homemaker, a good teacher, a good worship leader . . . but I was miserable. I was just surviving and my spirit was longing to thrive. By definition SURVIVE means to endure, to live or exist through an affliction, adversity, or misery. Many of us have “survived” terrible hardships. Maybe you’ve survived a physical hardship. Maybe, you’ve survived a life-threatening situation. Whatever situation you survived, you can look back on those days and see that God has certainly brought us through, hasn’t He? While we have survived many hardships and situations, do we really want to “live or exist in misery”? Do we really just want to “survive life”? By definition THRIVE means to prosper, be fortunate, successful . . . to flourish. 3 John 1:2 says, “Beloved, I pray that you may prosper in all things and be in health, just as your soul prospers.” God desires us to live prosperous and blessed lives, not lives of merely existing or just getting by. His desire is for us to thrive and flourish, prosper and be successful. To thrive should be our life’s goal. Why should we desire to rule and reign in life? Because in reigning we go from surviving to thriving. How to Thrive in Life? 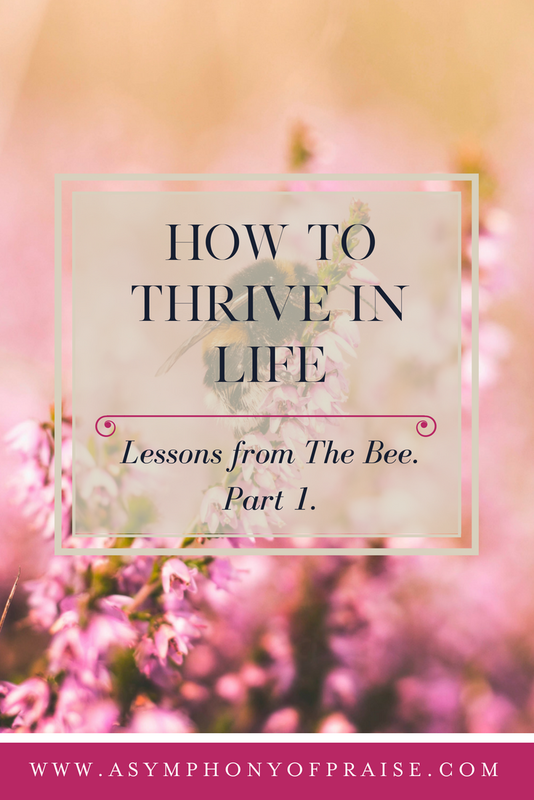 We can learn so many lessons from the bumblebee that can give us a look into HOW to thrive in life. 1. CREATE A ROYAL BUZZ. To thrive in our lives we need to be creating a “royal buzz”. Ask yourself, what kind of sound does your life create? Your words frame your atmosphere. Are your words creating a life of peace or chaos? Joy or anger? Healing or hurting? Do you constantly bring drama and verbal attacks? Do you constantly nag? Are your words filled with bitterness, anger, and hate? Or, like the bee, does your “buzz” pollinate the lives of those around you causing them to bloom. Do your words cause things to grow? Does your speech bring beauty and life? Ephesians 4:29 says, “Let no corrupt word proceed out of your mouth, but what is good for necessary edification, that it may impart grace to the hearers.” To thrive in this life, you must be the Queen who uses her buzz to build up and not tear down. In fact, when a hive switches Queen’s, the Queen will determine the atmosphere of the hive; often bringing change when needed. Some Queen’s encourage aggressiveness and others hard work and success. What kind of Queen do you choose to be? I have a pretty pink flowering bush out by my patio. Every spring, a swarm of bumble bee’s come to collect pollen from the pink flowers. Every morning, I have breakfast on my patio, and without fail, my bee friends are awake with the dawn, and they are working. Asher has named them. “Buddy Bee” is his favorite. Our sweet bumblebee friends buzz about working hard all day. A bee must visit two million flowers to give us one pound of honey. The average worker bee will only produce 1/12 of a teaspoon of honey in her lifetime. That seems like a lot of hard work for a very little result, doesn’t it? When I studied the worker bee, I couldn’t help but notice that she sounds a lot like The Proverbs 31 woman. If you want to thrive in this life, you must work hard unto the Lord. The bumble bee doesn’t know that we enjoy the honey they work so hard for. They aren’t working for us. The bee’s are working unto the Lord because that is what they were created to do. You may be a stay-at-home Momma. You may be a teacher, a blogger, a nurse, or the CEO of a Fortune 500 company. Whatever your work may be, do it with all your might unto the Lord. You may never reap the applause of man, but like the bee, you aren’t working for man . . . you are working unto the Lord. Now that may seem harsh, but follow with me. Remember when you were a kid and someone shouted at you on the playground, “Mind your own beeswax!”. The term, mostly used by seven-year-olds, means “mind your own business”. As I watch my bee friends work each morning, I can’t help but watch how they mostly work alone. They go from flower to flower “minding their own beeswax”. “Buddy Bee” isn’t looking at “Bella Bee” to see what her flower looks like. She isn’t comparing how much pollen Bella has gathered compared to the amount she has gathered. Buddy isn’t jealous of how Bella looks, flies, or buzzes. Buddy puts her little bee head down and gets working. My friends, if you want to thrive in life, you must mind your own beeswax. Stop comparing your life to the little squares on Instagram. Stop comparing your entire life to someone’s highlight reel on Facebook. Your business is not their business. Your family is not hers. Your hair, height, weight, clothes are uniquely yours. Own it! And let us stop the sickening, fruitless, and destructive comparison game. Theodore Roosevelt said, “Comparison is the the thief of joy”. Such truth. The fastest way to ruin a day is by comparing yourself to someone else. To receive your FREE 22 Page Ebook on How to Thrive in Life, CLICK HERE. This beautiful Ebook will give you the tools you need and practical application that will help you THRIVE and not simply SURVIVE! CLICK HERE for PART 2 in the Series! Inscribe the Word . . . June Scripture Writing Plan.